The cooking method is similar to a pilaf or pilau. The only differences is the type of rice and a pilaf's crusty bottom is desireable (the only time a crusty bottom is acceptable) Risotto sounds so exotic and complicated and it really isn't. It's a special dish made with special rice that Italians have cultivated and the rest of the world has messed up. Books and such will tell you that you need to constantly stir and watch over this for 20 minutes to achieve perfection. You can safely chop up the vegetables for your side dish, admonish Johnny for spoiling his dinner with the potato chips, or call your husband to tell him to bring home some more eggs because you're out. Now don't go into the den and watch the latest installment of "Young and the Restless" either, but you get my drift. Arborio is the rice of choice here. Its short, fat grains have a hard starchy center and a soft starchy shell. Chardonnay is my wine of choice because it's known for its creamy textures and it pairs well with the soft characteristics of the risotto. I added a silken chicken recipe to add to the luxurious mouthfeel of the riso and wine. Using a heavy bottomed pot or skillet, heat the olive oil over medium heat and sweat the onions until translucent. Try not to let the onions brown. Add the Arborio rice, stir to coat with the olive oil, and saute with the onions for about 5 minutes. Put the stock in a saucepan and heat to a gentle simmer on the stove. *I used my tea kettle to heat the stock. I also used Kitchen Basics chicken stock. It comes in vegetable, meat, and fish too. It's the best commercial stock I have ever come across. Make sure you DO NOT use any stock or broth out of a can. Flat tinny flavors are all you're going to get going this route. If you are going to take the time to make this rice, you should do it right! With fresh/high quality ingredients! If you feel comfortable making your own stock, you should do it. Freeze what you don't use in ice cube trays, pop them out, put them in plastic bags. 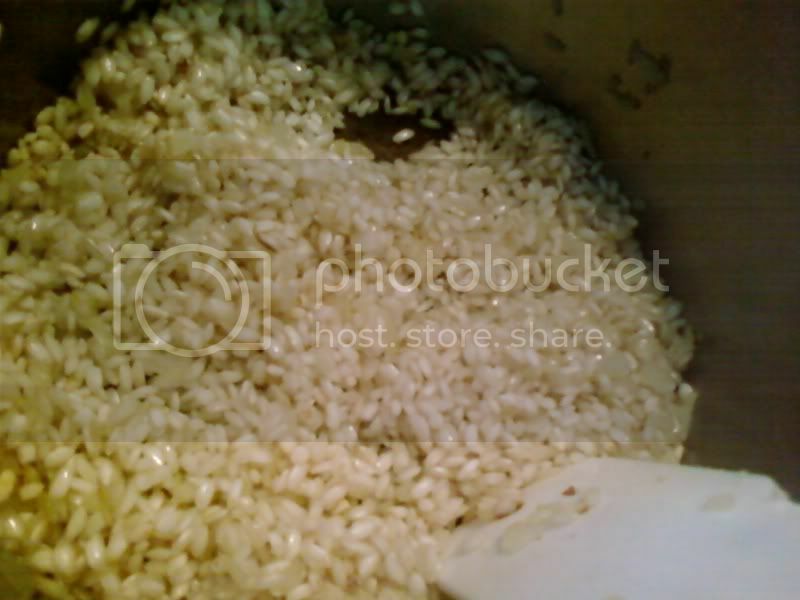 Add the wine, stir and let it cook until the wine is almost completely absorbed by the rice. Add 1 cup of stock and stir frequently until it is almost completely absorbed. Using a wooden spoon, paddle, or high-heat spatula will prevent the rice from sticking to the bottom of the pot. I heard that a metal spoon damages the rice kernels but I've never taken a liking to scraping metal spoons against the bottoms of my pots so I won't be testing this theory. Continue adding the broth, 1 cup at a time, until it is gone. Periodically taste the rice to determine its doneness. It should be tender yet firm to the bite, like al dente pasta. If it's too hard, keep adding broth or water until it's done. If it's too soft, that's OK. It's not ruined. Lastly, stir in the butter and salt and pepper to taste. The butter adds a bit of flavor and a nice sheen to finish the dish. I've taken the silken chicken idea from Madhur Jaffery's Quick and Easy Indian Cooking. Her recipe involves garam masala and chicken breasts. My recipe involves a homemade seasoning mix and chicken legs. I didn't want my chicken to taste of the subcontinent today and the legs were on sale. It can stay in the marinade, covered and refrigerated, for 6 to 8 hours, up to 24. Lift the chicken pieces up and place them in a single layer in a shallow baking pan lined with aluminum foil. On top of each leg, sprinkle a little salt and black pepper; A little more no-salt shake is OK here too. Put into the top third of the oven and bake for 20 minutes or until the chicken is running clear juices. Serve immediately. 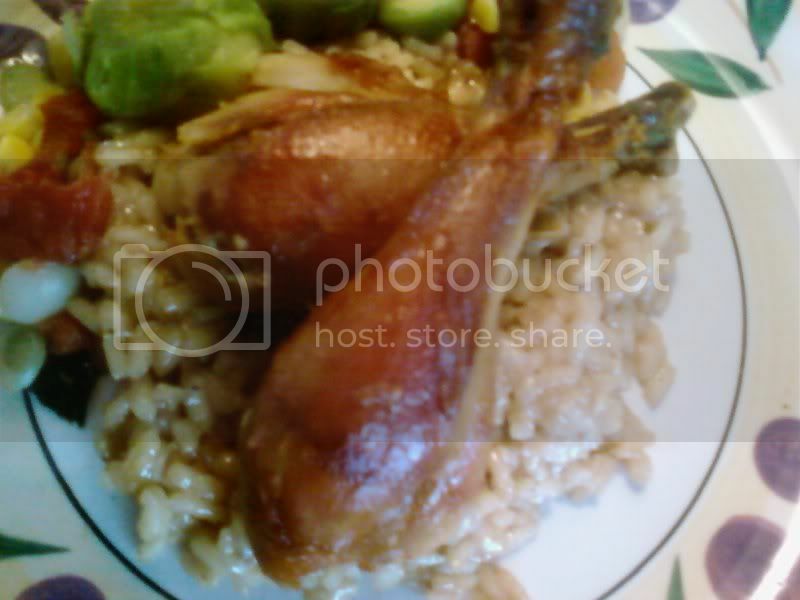 The chicken atop the risotto is accompanied by Brussel sprouts (steamed, braised, then sauteed with garlic and onions) and a quick succotash. Now that looks tasty! I love risotto. I like the arborio versions as well as the Carnaroli. I can now find Carnaroli at WF and TJ but not at the mega-marts. Risotto is so versatile. Oh, and I have some decent free-range stock that I found at WF. I use so much stock, I have to keep some boxed on hand. Maybe 10 years I bought arborio rice at an Italian store. However, the recipes that I found (these were my pre-internet days) were so full of admonishments about constantly stirring the risotto dampened my enthusiasm. A few years ago, my pantry invaded by meal moths, I tossed the rice and never bought more. I have copied your recipe and instructions and will give it a try again soon! Thanks for yet another well thought-out post! Vicci: I'm glad you are going to try risotto again. It really is so incredibly simple. And I'm not just saying that because I know what I'm doing!